Casa Severina is an architectural Endeavour, conforming to the orthodoxy yet refreshing & surreal... An attempt to re-incarnate a lost glory of vernacular heritage, ethos, culture & architecture... that’s Casa Severina for you, a charming boutique retreat in Goa. 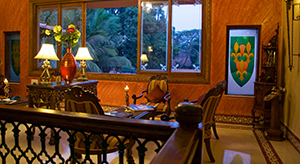 This Hacienda with all its luxurious trappings is located in Calangute. 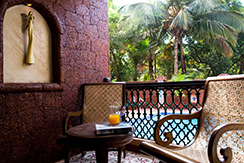 The Casa is not a hotel, it is a gracious residence …an experience. Like a family house... guests are received here as a part of the family. 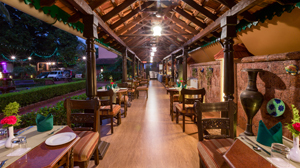 True Goan Art de vive hospitality. As the owners, Mrs. Feliciana & Mr. Joseph Sequeira like to put it, "Come in as guests...and leave as family"
There's enough to worry about when traveling to a new place, so many travelers these days eschew the large, non-descript hotels in favor of something a little more comfortable, intimate and welcoming... which is what Casa Severina offers. The Casa is an ode to their Granny Severina, after whom the place is christened. With Casa Severina, the Sequiera family have brought alive their granny’s dream of an inviting traditional home on a beautiful land with many secrets to tell. This hacienda is designed to offer privacy and a sublime spirit reminiscent of an inspired Batkar’s mansion (Batkar – Portuguese word for landlord). Enter the Casa Severina and you are enveloped in an oasis of calm, drawn into a retreat of peace, left alone to savour its gentle, romantic and welcoming atmosphere. Casa Severina leaves you refreshed, inspired and renewed. 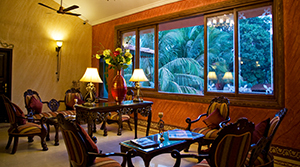 Family owned and operated, the atmosphere of informal good taste and the constant updating of services provided make this charming hacienda- your best friend's home in Goa. 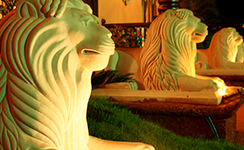 You will be indulged with exquisite, personalized service in a warm, inviting, and unique atmosphere. The moment you step into the Casa Severina you will immediately recognize this is no ordinary place. The magnificent classical elevation of the Hacienda is hidden from view until you are just there. Now you are greeted by a turnabout drive and teakwood stairways ascending to the main entrance under a terracotta tile covered porch. 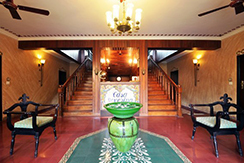 As one arrives, the inviting warm teak wood stairways lead you effortlessly on to the decorative double height foyer resplendent with beautiful hand painted frescos. Just when all you want is to close your eyes and absorb the beauty, a glimpse down into the courtyard steals your breath... an ethereal fish pond complete with majestic panther heads spouting water. 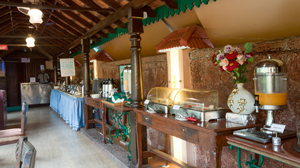 Upon arrival, you are greeted with timeless décor and staff that are personal and genial. 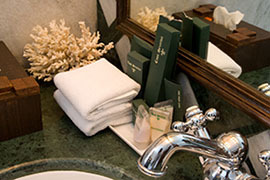 Your stay at the Casa begins with a welcome beverage and cold towels at check-in, followed by a familiarization with our guest rooms, amenities and services. All the 19 rooms have balconies for lounging and star-gazing. At the Casa, you feel no lesser than the lord or lady of your own manor. At the Casa there are other indulgences. The luxury outdoor pool... when the warm breeze blows across the blue skies, you cannot but indulge in its tempting cool waters. 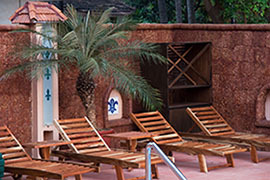 Used to enhance, change, set the tone or simply add drama, beautiful tiling motifs in the surrounding walls magically transform the poolscape. The pool’s unrestricted timings just make you feel, at home. Luxuriate in the ‘richness’ of the experience of walking through the Casa’s landscaped gardens, where simple details, straightforward line,s and an amazingly colourful plant palette conveys elegance. The romance of a bygone era completes with an enticing wish fountain with viewing gazebos and the wishing well that greets you by the gate. A cosy breakfast den, the ‘el Patio’ is warm and inviting in hues of the earth and coral greens. Almost like the Tuscan countryside has been brought indoors... elegant wrought iron furniture, earthy brick décor, unusual artefacts, an antique telephone – just the place to savour your breakfast. Not looking for company, burrow in the interesting collection of books here, provided to add to your already relaxed stay. Two steps onto the breathtaking ‘el Salon’ overlooking the tranquil lawns; you rest a bit, whilst waiting for the sun to set, so you can surrender yourself to our antique telescope gazing the starry nights or just ensconcing yourself with the tropical breeze. But in all this interlude, may we remind you of something else to steal your moment - your room awaits you. The rooms themselves bespeak the romance of a Spanish sonata with classical furniture, billowing curtains, soft textiles and even softer cushions and pillows. For that extra touch of total private luxury, Casa Severina delivers… and more. Recharge at the Casa, where nothing is overlooked but the sea. Casa Severina, with her lavish gardens is the ideal resting place for those seeking a relaxing and tranquil holiday. Here is a sense of living in a private-home, surrounded by the opulence of fine paintings and antique furniture. Indulge not only in its genuine period surroundings, but also in the comfort and luxury that’s Casa Severina. With the Calangute Beach only a five-minute stroll away, you are close enough to hear the surf and smell the salt. Just a step or two from the surf and sunset. Bardez, Goa - 403516. India.